Gospel for Asia defendants K.P. Yohannan, Gisela Yohannan, Daniel Punnose, David Carroll, and Pat Emerick have requested until May 9, 2016 to respond to the RICO lawsuit filed on behalf of former GFA donors Matthew and Jennifer Dickson. 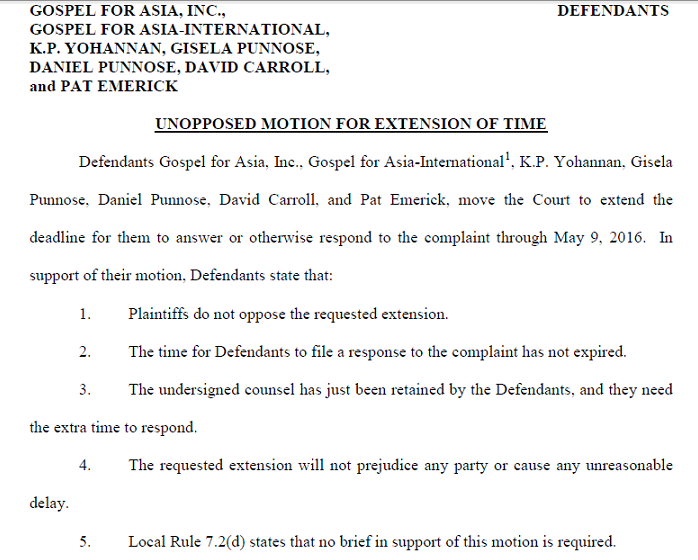 In February, the Dicksons filed a racketeering suit against the leadership of Gospel for Asia alleging misuse of funds and fraud (click link for the suit and more information). UPDATE: Although the defense requested 60 days to prepare a response, the judge shortened the period to end April 15. In exchange for the extension, the defense agreed to accept service on the suit on behalf of K.P. Yohannan who apparently is still out of the country. GFA’s defendants are being represented by Locke Lord, a prominent law firm in Dallas.